The evening before the 21st Ordinary Congress of the African Hockey Federation was the presentation of some special awards and dinner.Some of the dignitaries present were the executive board of the Africa Hockey Federation, Presidents of National Associations, Dignitaries from International Hockey Federation and some Invited guests within the Field Hockey Fraternity. 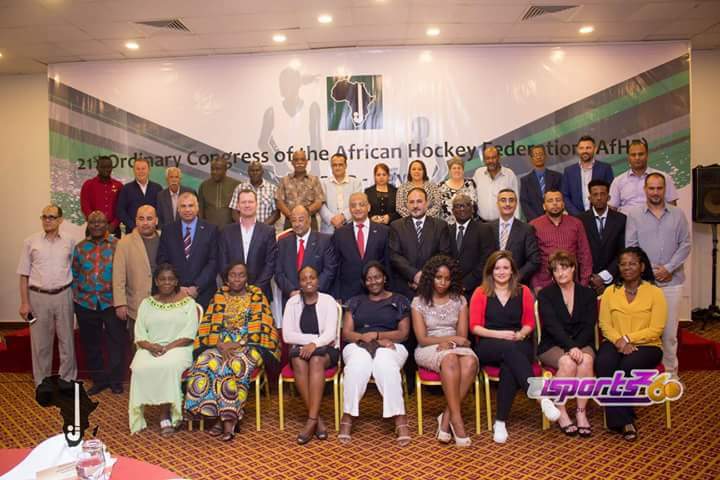 The awards presented at the ceremony were to some individuals for their meritorious service to the Africa Hockey Federation and the International Hockey Federation. Jason McCraken, the Chief Executive Officer of the International Hockey Federation was also present. The Umpire of the Year Award presented in memory of Ayman Adham Amin went to two umpires from South Africa. Notable of these awardees were, Michelle Joubert. An umpire who officiated the Rio Olympic Games Women Final and the World League Series Final in 2016. She has also been appointed to officiate the World League Series final in Auckland, New Zealand. Verily, she happens to be a well respected umpire all around the world. Peter Wright, who officiated in The Hockey World League Semi Final in Johannesburg (July 2017) , Pan American Games and the Junior World Cup in India was also honoured. Moreover, former Ghana Hockey Association’s President, Oko Nikoi Dzanie was presented with a Special Award for his contribution to Africa Hockey. The 21st Ordinary Congress of the Africa Hockey Federation commences at 9am today. There shall also be the Extraordinary congress meeting and Elections also.